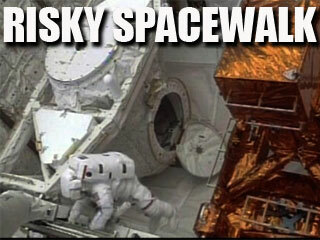 U.S. Astronauts began a risky spacewalk about two hours ago to repair & upgrade the Hubble Space Telescope. Among their maneuvers will be a camera upgrade. The old one allowed us never before seen views of space & will end up in the Smithsonian. The new one will look deeper into space & is the size of a baby grand piano. The little boy inside me spoke up, "Wow! Wouldn't that be a cool thing to be doing this morning! Walking in space. Floating around. Seeing Earth like a glowing ball. Awesome!" The grown man inside spoke next, "That took years of dedication & training to get there. And even though those guys are weightless they are in those heavy, cumbersome suits. And for each one guy out there working he actions are directed by countless many." You've seen the space movies, right? How many people watch monitors & give instructions & updates down here while a handful are up there? The Christ-follower inside had the last word, "I can be weighed down & encumbered by the sins of this world, yet freed to weightless dependence as I confess to my Savior. I am part of the Body of Christ, the church, & although we are many we seek our direction from only One, our Lord Jesus." What needs confession today? How is he directing me to follow?